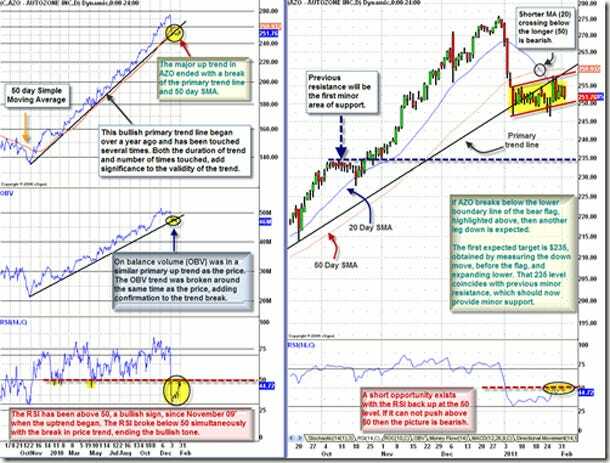 An end to the primary up trend in Autozone Inc. (AZO) was recently signaled by breaks in the 50 day simple moving average and the bullish primary trend line. Currently, the price is consolidating in a bear flag pattern. If the lower trendline of the flag is broken, a move to $235 is initially expected. The charts below illustrate the break of the bullish primary trend and highlight the bear flag pattern. Aggressive entry: short on a bounce before the trigger.